It has been suggested that this photograph was taken in the 1920s, but the clothing might indicate a different decade. If you remember the cattle market, can you date this photograph? This picture is how I remember the cattle market in the 1940s. And the cattle pens at the railway station where the cattle were unloaded from the trains and driven round to the market. 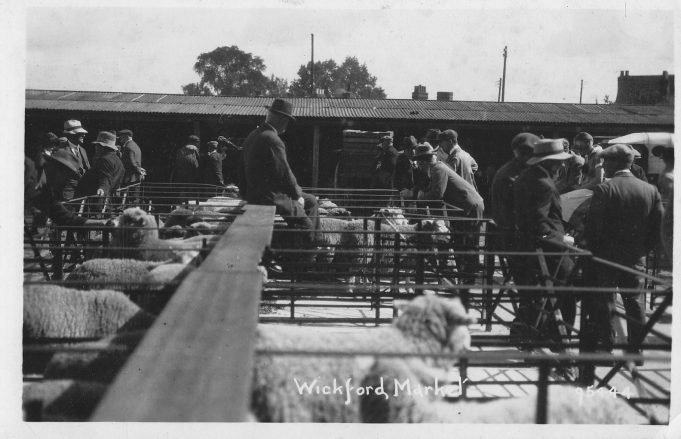 As a very young boy, both I and my neighbour, same age as myself, visited the livestock market on several occasions. We would cycle from Laindon with a cardboard box tied to our handlebars, and a few pennies (old ones) in our pockets. On each visit we bought day old chicks for 1d each, these we transported home in the cardboard boxes. On one visit we even bought young rabbits, we must have had a good bit more money to spend. The market was a bustling place and as you might imagine was a source of great excitement, adventure and pleasure to two young lads. I seem to recall we were about 10 or 11, different days back then, never to return. This looks like when it was the area opposite what is now Barclays Bank, after the second world war. The poultry market was next to The Castle pub, where Aldi is, with Layland and Thorne the auctioneers. I remember at school we had to get letter from mum to say we could be out of school at dinner times to go to the market. Many a time cows or the odd bullock would get loose and run through the High Street or the school surrounding fields. The indoor market was in a compound surrounded by a corrugated fence alongside the railway line, behind what is now Boots etc.